Contractor - Albuquerque Underground, Inc.
A new roadway was proposed over a sanitary landfill in Albuquerque, NM. The project was located very close to existing structures, including a residential retirement village and a post office. Dynamic compaction was proposed for the improvement of the landfill materials so that the new roadway would not settle after construction. 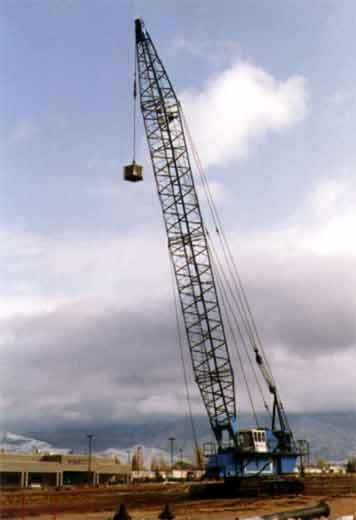 TerraSystems used a 15 ton weight falling from a height of about 60 feet to compact the landfill. Three high-energy phases were used, followed by a low-energy or ironing phase. A total subsidence of one to two feet occurred during the tamping operations. Since sanitary landfills do not lend themselves to in-place testing by standard penetration testing, cone penetration testing, dilatometer tests, etc., the acceptance testing was based on measuring settlement under a 10 foot high mound of soil approximately 30 feet in diameter at the base. The landfill settled less than a half inch under the test embankment load. The roadway was constructed in 1993 with no discernible settlement since that time period. Vibration monitoring was performed continuously during the tamping operations. No vibration damage occurred as a result of the dynamic compaction program.